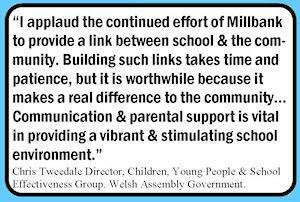 We do not have all the resources available to bigger schools but we like to think the website and newsletter demonstrates that we really do have 'heart' and are 'family focused' as well as 'community focused'. We started doing them way back in 2002 as part the 100th Birthday celebrations and the weekly newsletters are now an important feature of the school as "it clearly shows the commitment to parental involvement and communication." We produced a special 'Community Edition' as part of the celebrations for the 300th edition of the newsletter, which we delivered to some of the local homes nearby. Again it was done by volunteers and like all these online versions no money was diverted from the school budget or the children's education. 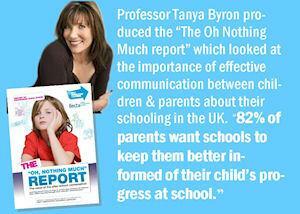 A governor survey had 96% of parents & carers saying that they regularly read the newsletter. Parents had told us that often the occasional note from the school would not make it out of the children's backpack, but parents at Millbank know to look out for the weekly newsletter. When asked 'what have they done today at school' pupils at any school will often say 'nothing' and shrug their shoulders. So by looking at the newsletters parents can become more aware of what is going on the themes and projects that the children are involved in and take an interest too. These online pages can even allow parents to catch up in work or allow other family members to see the children's article or news. The school also offers to e-mail parents a copy. This online version normally has names and other details blocked out as part of the web safety policy. It also means that we always update the website/gallery at least once a week. As you can see the Newsletter provides information on events and activities not just at the school but in the wider community. Many of the children take the photographs and children often write articles about their hobbies or their favorite books, and the newsletter often showcases success in sport and activities outside the school too. It also allows groups like the School Ambassadors & Council, Junior Road Safety Officers, Green Gang not to mention the Reporters Club to reach a wider audience and get their messages out. 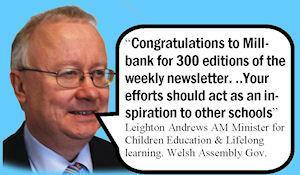 Last years newsletters can be found in the 2009-2010 gallery.